Rana ornativentris is scientific name. It means “frogs that have pattern on belly”. The common Japanese name for this species is the Yamaakagaeru. It means “red mountain frogs”. In Japanese, “red” means “brown” at times. And the common English name for this species is the Montane brown frog. It means “brown mountain frogs”. As both names mean, this species lives in the mountain and the body color of it is brown. The Montane brown frog was familiar existence in people. But now, its number is decreasing. The males of the Montane brown frog grow to 42~60mm, and the females grow to 36~78mm. Females can grow bigger than males. As shown in the name, its body is brown. But, when it is young, the body is black or brown. It has no black dots on the lower jaw. And it has no warts on its back. At the fingertips, it has no suckers: therefore this species doesn’t adjust at the arboreal life. But the Montane brown frog excels in the swim because of the developed webs. The Montane brown frog looks like the Japanese brown frog (Rana japonica) well, but they can be distinguished in the point of the shoulder line. Rana japonica’s shoulder line is straight, while the Montane brown frog’s shoulder line is curved. The Montane brown frog belongs to the brown frog family Ranidae. And, this species belongs to the brown frog genus Rana. The brown frog family is distributed all over the world except Antarctica and Australia. 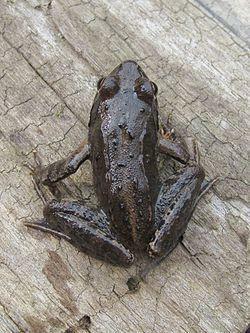 23 species including the Montane brown frog, the Japanese brown frog, the Black-spotted pond frog (Rana (Pelophylax) nigromaculata) etc. are found throughout in Japan. The mating season of the Montane broen frog is January to May. The Montane brown frog croaks in a little high voice like chatting though it usually croaks in a dry voice that like a guiro. The croak heard like “Kyararara”. The Montane brown frog spawns in comparatively cold season. Its spawning season is January to June. The Montane brown frog spawns more than 1,000 eggs once a year. The egg is black and wrapped in the cohesive gelatinous material. This material protects the egg from dryness. Then, the egg hatches about 14 days. The larva is called a tadpole in English. Next, the larva metamorphoses into the immature in May to August. Finally, it takes about 2-3 years to become adult. This frog is found throughout in Honshu, Shikoku, Kyushu and Sadagashima. The larva lives in paddy field, pond, marsh and bog. The larva of the Montane brown frog is omnivorous. It eats fallen leaves, water plants, aqueous insects, and carcass, etc. there. The larva goes up ashore when it grows up and the adult lives in forest from plain to mountainous district and the peripheral paddy field. The adult is carnivorous, and it eats insects, shellfishes, and earthworms, etc. The Montane brown frog needs the sunny, shallow water place that doesn’t flow for the spawning. In Japan, the paddy field in mountainous district is a suitable habitat for the Montane brown frog. 14 species of 23 species of the brown frog family that live in Japan are indigenous species, and the frog of the brown frog family can be said the most popular frog for Japanese. When the cultivation of mountainous district was active, the Montane brown frog was also familiar existence in people. However, the number of the Montane brown frog is now decreasing by reduction of the habitat and dividing into parts of living area and breeding area. They are specified to the vulnerable species or the near threatened species in several prefectures. In Kochi, the Montane brown frog is not specified for the Red Data Book, though its habitat decrease. Overall, this article is very detailed.